"As sailors are guided by a star to the port, so Christians are guided to heaven by Mary." The star image could be tied to any Marian feast day, but there is a very strong connection to the Assumption and the Star of the Sea title. In many places traditions associated with the sea are part of this celebration - like the blessing of fleets, blessing of the bounty of the sea, and wedding of the sea ceremony. These appetizers combine the star shape and the products of the sea to recall Mary under this title – Our Lady, Star of the Sea. I used Valley Lahvosh Baking Co. star shaped crackers though there are other star shaped crackers that could be used. I spread a smear of softened cream cheese in middle and added a lemony shrimp scampi on top. The lemon is a symbol of fidelity in love so is often associated with the Virgin Mary in Christian art. This is the recipe I used for the Lemony Shrimp Scampi (from Pampered Chef) though I used medium shrimp and halved the other ingredients. Another simple and last minute option would be to just pick up a prepared seafood spread or dip (like crab) and use that with the star shaped crackers. O God, you have willed that Mary should shine forth as the Star of the Sea and protectress for us who are tossed about on the stormy waves. Grant that through her help and direction, we may be safe from dangers of soul and body, reaching the port of eternal happiness. We ask this through Christ our Lord. Amen. These beautiful cookies, in honor of the Feast of the Assumption of the Blessed Virgin Mary into Heaven celebrated on August 15th, were submitted by LaDawn Wilson who shares, "I homeschooled six children for over twenty years. I now have three grandchildren I can bake for each week. I enjoy revolving most of my creativity around feast days and the children's birthdays." Thank you, LaDawn! "The cookies are a basic sugar cookie recipe but I added lemon emulsion and poppy seeds. I used two stamps for the fleur de lis. I like to paint directly on the stamp using AmeriColor Gels and then stamp the cookie on completely dried white glaze. 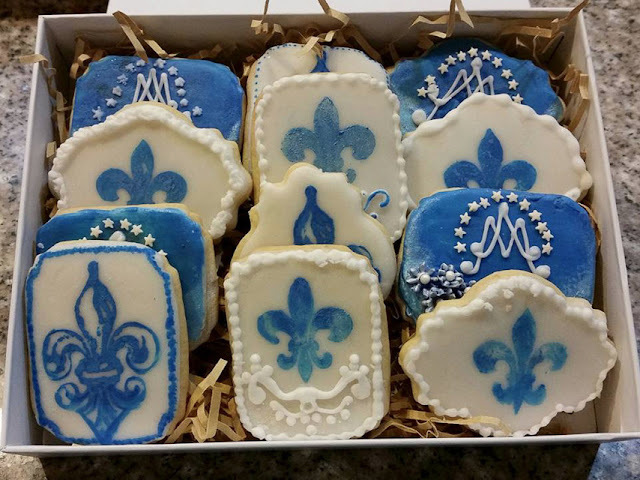 Royal icing is used for the white borders and Ave Maria symbol. The tiny flowers are made from fondant." You can find additional ideas and recipes for the Assumption in the archives! 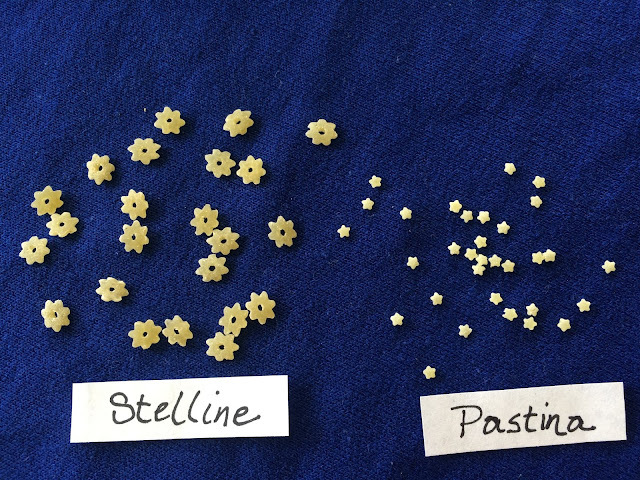 There are several small star shaped pastas in the variety referred to as stelline (Italian for "little stars"). It is sometimes simply packaged as pastina which is a the generic variety of of tiny pieces of pasta available in a variety of shapes. Pastina is the smallest type of pasta produced. These pasta are common for broth based or thin soups. August has several feast days where this tiny star shaped pasta, stelline, could be used as a symbolic reminder of a saint in a recipe. St. Dominic (August 8) - On Monday we celebrated the feast of St. Dominic de Guzman. St. Dominic, the Spanish priest and the founder of the Dominican Order received the rosary from Our Lady and the child Jesus. It is said when St. Dominic was a baby his godmother saw a star on his forehead during the baptism, so a common attribute is a star either on the forehead or above his head. St. Lawrence (August 10) - Wednesday is the feast of St. Lawrence, deacon and martyr. Due to the timing of his feast in mid-August at the peak of the Perseid meteor shower, that annual asteroid showing is often called the "tears of St. Lawrence." So a "shower" of stars in some dish would remember this tie to St. Lawrence. Assumption (August 15) - Our Lady is known by many star titles - - Star of the Sea (Stella Maris) and Morning Star (Stella Matutina) being the most prominent. Other titles or images include Star of the New Evangelization, Madonna della Stella, Star of Jacob, Fixed Star. The star image could be tied to any Marian feast day, but there is a very strong connection to this feast and the Star of the Sea title. In many places traditions associated with the sea are part of this celebration - like the blessing of fleets, blessing of the bounty of the sea, and wedding of the sea. Our Lady of Guadalupe (December 12) - In the image on St. Juan Diego's tilma we see Our Lady clothed in a mantle of blue with 46 stars. Epiphany (January 6) - And of course we associate a star with the visit of the wise men who followed the Star of Bethlehem to the infant Jesus. Our Lady of Pontmain (January 17) - Our Lady of Hope appeared to several children at Pontmain, France. They described her as surrounded by stars. "Oh, there are so many stars the Blessed Virgin will soon be gilt all over.” Images of her under this title show he clothed in a blue mantle gilded with golden stars. St. Thomas Aquinas (January 28) and St. Nicholas of Tolentino (September 10) both are shown with a sun/starburst on their chest in many depictions. St. John Nepomucene (May 16), Bohemian priest and martyr for the seal of the confessional, is often shown with five stars over his head (because, on the night of his murder, five stars were seen over the spot where he was drowned). 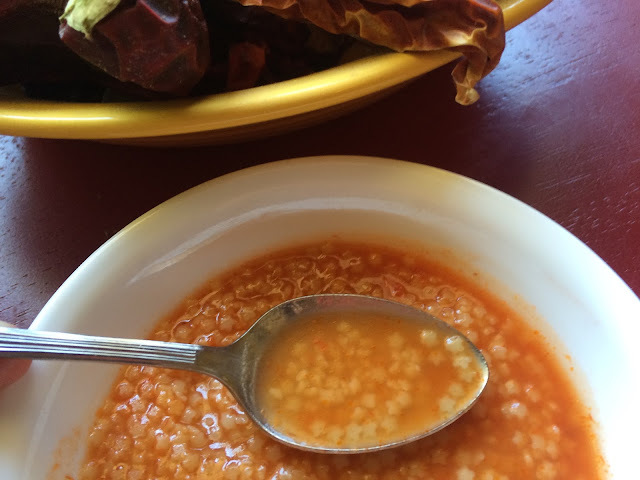 This week for the feast of St. Dominic I modified a typical Spanish tomato broth sopa, using stelline pasta instead of the typical fideo to celebrate the Spanish Dominic de Guzman. Saute garlic in olive oil. Add chicken broth and tomato sauce. Bring to boil. Add dry pasta and simmer until pasta is tender. Add more liquid if desired for thinner consistency. Add salt and pepper. Orecchiette from the Italian orecchia, meaning "ear", and -etta, meaning "small" is a variety of pasta from southern Italy. Its name comes from its shape, which resembles a small ear. The ridged exterior and cup-like interior holds chunky sauces and scoops up small vegetables, making orecchiette perfect to serve with sautés. Last year, I posted an orecchiette recipe called tuoni e lampo which is a traditional Italian pasta dish with chickpeas. Its name, I thought, linked it well to the story of thunder and lightning associated with St. Scholastica and St. Benedict. But focusing specifically on the ear shape and its name, this pasta would be a fun one to use for a variety of saint feast days associated with ears and hearing. Today we celebrate the feast day of St. John Vianney, patron of parish priests and confessors. St. John Vianney was especially known for his gift as a confessor. He drew thousands of penitents to line up, sometimes days in advance, to experience what many recalled as his ability to see into the deepest recesses of the soul. For this humble priest who was known to hear confessions for up to 16 hours a day, the ear pasta seems a fitting symbol. Some other saints who have connections associated with hearing and ears are listed here – many coming up soon in September. St. Francis de Sales (January 24) - He was known as powerful confessor during the Counter-Reformation. His masterpiece of the spiritual life, Introduction to the Devout Life includes the well-known, “How To Make A General Confession.” He is the patron of the deaf and hearing impaired. St. Benedict (July 11) - St. Benedict in his rule begins the Prologue with these words: "Listen carefully, my son, to the master's instructions, and attend to them with the ear of your heart." St. Alphonsus Liguori (August 1) – He is a patron of confessors and wrote much on the sacrament of confession. St. John Vianney (August 4) – He was known for hearing confessions up to 16 hours per day and is a patron of confessors. St. John Chysostom (September 13) – An early Church Father, he interpreted the epistles of St. Paul. He is often depicted in iconography with St. Paul whispering into his ear. His ear is incorrupt. St. Cornelius (September 16) – Pope St. Cornelius is a patron of hearing ailments due to his name coming from the Latin for horn, and in art is usually shown holding a horn, the type that was used in the Middle Ages to rally troops in battle. These horns had a similar shape as the ear horns that hard-of-hearing people once used to amplify sounds. By this process, he became the patron of ear ailments. St. Pio of Pietrelcina (September 23) – Confession was his primary activity of the day. He was known for reading souls in the confessional.